This is a list of bosses in Super Mario world, for a list of common enemies , see here. Reznors are fire breathing triceratops and hang out at the end of fortress levels. The only way to beat them is to knock them off of their platform by jumping from underneath it. If you knock two of them off their platforms, the floor will begin to collapse from the center in. Jump up to one of the platforms the Reznor was on for safety. From there, you will need to jump up to hit the rest of the Reznors. However, if you're quick, you can sometimes defeat all four Reznors without having to jump on the moving platforms. In later fortresses, the rate at which the floor disappears increases. If you're not that quick it's best to knock off two opposite Reznors first so that you don't have to change platforms while defeating the other ones. Another strategy is to become small Mario. This gives you a smaller field to be hit. The downfall is that it is a one hit kill. The Big Boo is a large white ghost found in ghost houses. Like Boo Buddies, you can stop them from pursuing you by looking at them. Mario cannot jump over it, he needs to lure him out of the way or use a high platform. The Big Boo is also a boss within the Donut Secret House. 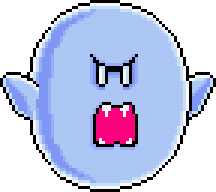 The boss form is transparent and cannot harm Mario, so two normal Boos are near him. Hit it with three grab blocks to reach the secret exit. Iggy Koopa is the first Koopa boss in the game, located in his castle on Yoshi's Island. He is stationed on a tilting platform and must be pushed into the surrounding lava to be defeated. Normal Jump: A normal jump will cause Iggy Koopa to fall to one side of the stage. Spin Jump: Has the same effect as a normal jump. Jump with Yoshi: N/A Yoshi is not allowed in castles. Fireballs: Will push him towards the edge of the stage. Yoshi's Tongue: N/A Yoshi is not allowed in castles. Yoshi's Fireballs: N/A Yoshi is not allowed in castles. Morton Koopa Jr. is the second koopa boss in the game, located in his castle in Donut Plains. He is stationed on a platform over a large lava pit confined by two large pillars, he must be hit when he is on the ground three times to be defeated. When defeated, he will fly off into the horizon and explode. Normal jump: A normal jump will weaken Morton Koopa Jr,you must hit him three times to defeat him. Fireballs: 10 fireballs will defeat Morton. This also effects how many hits it takes to defeat him. For example, one fireball and two jumps will defeat Morton while two or more fireballs and one jump will also defeat him. He appears in Castle 3. Hit him when he comes up out of the pipes, however he has two fakes. 3 hits take him down. Use the spin jump to avoid the fireballs roaming the area. Also, it is possible to jump on Lemmy's head after hitting one of his minions. You just have to be quick about it. It also works vice versa: You can hit a minion after hitting Lemmy's head. Sort of a mix between Iggy Koopa and Morton Koopa. He will spit fire balls for a main attack, either jump or duck to dodge it. He will then go in his shell and try to hit you. After you beat the forest fortress, you will have to face him. You and he will be enclosed over lava between 2 pillars that slowly move together. Eventually, if you're not fast enough, they will crush you. Roy Koopa doesn't throw anything at you, but he does jump. Once you hit him, he literally bounces off the ceiling and walls. You will have to jump on him three times to destroy the castle! She appears in World 6's castle and is only a harder version of Lemmy (the only difference is that there are two fireballs). To destroy the castle, you have to face her. Jump on her 3 times to defeat her. The boss battle with Larry is just like the setting of the first boss battle with Iggy Koopa; there is a tilting platform where Mario must jump on Larry to push him into the surrounding lava below. But this time, there are jumping fireballs to the left, center, and right of the platform to avoid, making things a lot harder. 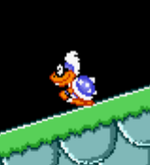 Normal Jump: A normal jump will cause Larry Koopa to fall to one side of the stage. Bowser is the final boss of Super Mario World. As is befitting of the Final Boss, he'll take the longest to fight, and will require more strategy than "jump on him three times to win". To fight him, avoid the clown copter's propeller (and Bowser himself, if you feel the need to try and jump on him/dive-bomb him with a Cape), and wait for him to throw out a couple of Mecha-Koopas. Knock them out by jumping on them, then throw it up so that it hits Bowser. Two clean hits will make him fly into the background and then into the screen, stopping the music in the meantime. Whilst he's off-screen, the music starts up with the same theme as when he's floating down, and he'll send down seven flames, then another three before he reappears. The Princess will pop out for a second, shout "HELP!" and throw you a mushroom. She's pulled back down, and Bowser pops up for another round, restarting the music. Bowser will just move left-to-right in a pendulum-style arc. Every so often he'll chuck out a couple of Mecha-Koopas to try and hurt you. Two hits will cause him to fly away and drop fireballs on the screen. Bowser will now float above Mario in an odd fashion, stopping to turn upside-down and drop a cannonball that's bigger than himself onto the castle to try and hit Mario. You can spin-jump off of it, which makes dodging it easier. He'll drop another one a couple seconds later. He'll then throw out a couple of Mecha-Koopas. Make sure that he's near the center, because a Mecha-Koopa that gets thrown off-screen won't walk back on if it goes too far. Two hits will cause him to fly off again. By now, Bowser will probably be a bit annoyed, and his clown copter shows it by adopting an angry look. Instead of relying on cannonballs, Bowser will try and land the clown copter on Mario. He'll bounce around for a while, trying to squash Mario, then after a while, he'll lob out a couple of Mecha-Koopas and resume his attack. Be warned that if you've KOed a Mecha-Koopas, it'll be knocked off the screen if Bowser lands on it. Another two hits will finish him off for good. Instead of flying off-screen, he'll float up a certain distance, the clown copter will give off noise and smoke, flip up-side down, drop the Princess (who'll float down on sparklies) and finally spin off into the background. Congratulations, you win! This page has been accessed 56,312 times.